It’s day 2 at #EuSEM18. Despite our best efforts the night before, the St.Emlyn’s team were up and on time for the morning of day 2. We had a great introduction to EuSEM on Sunday and you can read all about that in the day 1 blog right here. Here are the highlights from Monday. Simon, Gareth, Nicola and Chris joined together to form the Royal College of Emergency Medicine team taking part in the Euro Sim Cup which started in the morning, and the rest of us journeyed to the main auditorium for the opening keynote lecture. Gareth Clegg refashioned a fantastic mnemonic we’re already very familiar with in a lesson on how to implement change in emergency medicine. It’s important to find something to complain about, something you’re passionate about first before beginning your journey to change it and make it better. Great keynote on bringing change about in Scotlands cardiac arrest survival. B – basics, get them right, get buy in. Over in the pulmonary stream, Andy Neill delivered one of the best talks I’ve seen so far. Wonderful slides, clear speaking, funny, and some brilliant take home messages. I won’t say too much more as he’s even got a great blog post to go along with his presentation, so please go and read that. Why can’t everyone be like Andy? Nicholas Lim also gave a very good talk on lung ultrasound, and hopefully those of you reading this won’t need too much convincing that scanning chests can often provide much more information than a chest x-ray – so it’s another part of your multifaceted approach to the acutely dyspnoeic patient in resus. It just takes time and practice to make the most of it. A big tip was to ensure you save your images to show the admitting teams what you found, as often x-ray signs can be delayed. We finally got the answer to the EcLiPSE trial (looking into whether phenytoin or levetiracetam are more effective in seizure cessation in children presenting to the ED in status epilepticus) – it found there was no statistically significant difference between the two drugs. Interesting as published data (as referenced in the study protocol paper) suggest that phenytoin has a seizure cessation rate of 50-60% whereas levetiracetam is 76-100%. I have very little doubt that we’ll discuss the trial results as soon as they are published and I look forward to reading the results in full. #EuSEM18 @mdlyttle @PERUKItweep Eclipse study demonstrated no statistically significant difference between levetiracetam and phenytoin with (non statistically significant) trend to shorter seizure time with lev. In other morning streams Patricia O’Connor took us through doing a better knee examination, with some top tips on ensuring we do it properly. She even took us through techniques I hadn’t heard of such as the Lever Sign Test for diagnosing ACL rupture. You can read more about this from this paper, or listen to this RCEMLearning podcast by Andy Neill and Dave McCreary. There was more Bayes today from Nicholas Lim looking at pre- and post-test probabilities when using ultrasound. And, we got some more great human factors tips to consider during the resuscitation of the sick patient from Stephen Hearns during his talk on performing under pressure. Stephen has a fantastic blog and podcast with a plethora of resources around this subject which you should go and check out. Our attending population are getting older and older, and so it’s increasingly vital that we equip ourselves with the knowledge and skills to deal with the frail older person in the emergency department. Christian Nickel reminded us to make sure we don’t just reach for the haloperidol in delirium and to try to find an underlying cause. I always make sure I’ve thought about pain and whether they need the toilet first, so I was glad to see that his ABCs of delirium began with Analgesia, Bladder and Constipation. These are such simple things we can take care of for our patients. Tim Coats discussed the need to remember that major trauma can be underdiagnosed in older people, but certainly no less important. From the TARN database, we can see that this population has more low impact falls, indoors, and don’t get flagged up through the major trauma pathway, therefore don’t trigger trauma team assessment or senior clinician review. This has a knock-on effect on things like time-to-CT or transfer to a major trauma centre from a trauma unit. We need to get better at managing these low energy transfer trauma patients who often get identified a few days into their inpatient admission and therefore don’t get the same co-ordinated response that they would as the high impact trauma. Tim suggested that this means we need to set up a trauma response not only into the ED, but also outside of it. How brilliant was the #PEMadventures session in the afternoon? I know it’s only day 2, but I’m calling this right now. One of the best I’ve ever been to in any conference. A great mix of technological quizardry combined with some fantastic cases, relevant to our practice, and evidence-based and practice-challenging/changing to boot. Using an online question response software accessed through the EuSEM app, the audience (some of whom had to stand as it was packed!) chose our own story as we followed children with DKA, button battery ingestion, drug-induced methaemoglobinaemia, and stroke through their patient journey and decided their fate based on our management choices. Luckily they all survived (despite my best efforts). This is one format I’ll be sure to investigate in the future. 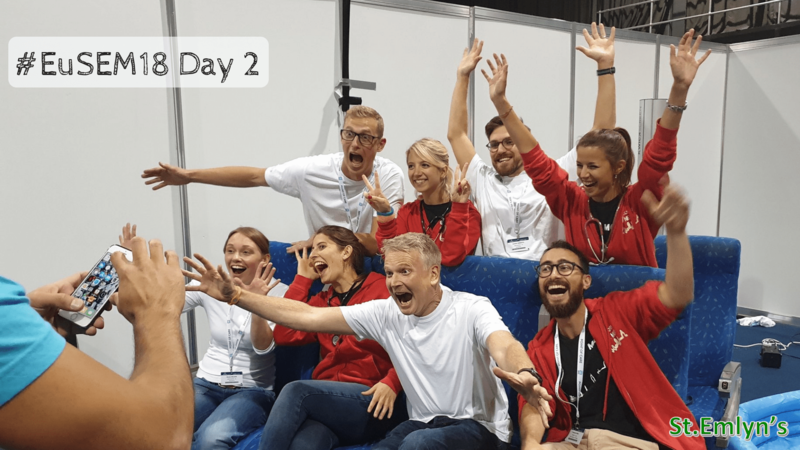 That was day 2 folks, hope you enjoyed this recap and found some useful practice-changing stuff either here, on Twitter, or live from the conference. Joint winners alongside a great Italian team – SIMNOVA. Top work these guys. What a result and all of us here are so proud of them! We certainly celebrated with them at the EuSEM dinner…! See you for day 3.